The Apollo 16 mission was designed to obtain the most extensive quantity and variety of photography of any mission thus far. There were several different varieties of photographic equipment, both on the surface and in orbit. The camera equipment operated on the lunar surface or in the LM by astronauts Scott and Irwin included three 70-millimeter Hasselblad Data Cameras (HDC, LM1, LM2), a 16-millimeter Data Acquisition Camera (DAC), and a color TV camera (LM4), or Lunar urfaceTV camera. The main photographic tasks during orbit were performed with the Mapping Camera System and the Panoramic Camera, which were in the SIM bay. Various tasks were also accomplished using four command module cameras: a 70-millimeter Hasselblad electric camera, a 16-millimeter Maurer DAC, a 35-millimeter Nikon, and a Westinghouse color TV camera. Three 70-millimeter Hasselblad data cameras were carried by the astronauts on the lunar surface. Two cameras (LM2) were equipped with 60-millimeter focal length lenses; the other had a high-resolution 500-millimeter lens (LM1). These cameras were battery powered, semiautomatic, and, for most operations, attached to the astronauts' pressure suits at chest height. The astronauts could initiate the operation sequence by squeezing a trigger mounted on the camera handle, and the cameras were operable at check stops at each half-stop value. A reseau grid was installed in front of the image plane to provide photogrammetric data, and the cameras were accurately calibrated. The 16-millimeter Maurer DAC had frame rates of 1, 6, and 12 fps in the automatic mode and 24 frames per second in the semiautomatic mode with corresponding running times of 93.3, 15.5, 7.8, and 3.7 minutes respectively. A green light emitted light pulses at the frame rates. Fiducial marks were recorded on the film. The camera could be handheld or used in a boresight mount on the lunar module on windows 1 or 3. Lunar Surface TV Camera. The RCA television camera (LM4) used on the lunar surface could be operated from three different positions -- mounted on the LM modularized equipment storage assembly (MESA), mounted on a tripod and connected to the LM by a cable, and installed on the LRV with signal transmission through the lunar communication relay unit. While on the LRV, the camera was mounted on the ground-controlled television assembly. The camera could be aimed and controlled by the astronauts or remotely controlled by personnel in the mission control center. Color was achieved by using a rotating disc driven by a 600-rpm motor. Lunar color scenes were scanned, filed sequentially, and down-linked serially to the Manned Space Flight Network. Video was received and recorded from lunar distance at any of the three Deep Space Stations. Mapping Camera System. The purpose of the mapping camera system was to obtain photographs of high geometric precision of all lunar surface features overflown by the spacecraft in sunlight. This camera system consisted of a 76-millimeter Fairchild mapping camera (SIM3) using 5-inch film, a 3-inch stellar camera using 35-millimeter film, and a laser altimeter. The electrically operated system was powered by 115 volts, 400 Hertz alternating current (AC), and 28 volts direct current (DC) spacecraft power. The laser altimeter, when operating independently, gave altitude data at a frequency of three data points per minute when the mapping camera was off and approximately 2.5 points per minute when the camera was on. The altimeter malfunctioned during the orbital mission, and no data were obtained after revolution 38. A complete girth of the Moon with the altimeter was acquired on revolution 15/16; sporadic data were recorded otherwise. About 30% of the planned altimeter data was obtained. The stellar camera was mounted on an axis at 96° from that of the mapping so that it photographed the sky while the mapping camera photographed the lunar surface. Any photography designated "stellar" refers to this photography, except that discussed as Special Photography and Experiments. The film cassette containing stellar and mapping photography was removed from the SIM bay by the command module pilot during trans-Earth trajectory and was returned to Earth in the command module. Panoramic Camera. The optical bar panoramic camera consisted of three major assemblies: (1) the roll frame assembly, which basically provided the platform for the rotating lens system; (2) the gimbal structure assembly, which rocked the roll frame assembly back and forth to provide for stereo photography and to compensate for the forward motion of the vehicle; and (3) the main frame assembly, which attached to the vehicle and provided a platform for the film transport system as well as for the roll frame and gimbal structures. Two mirrors folded the 24-inch (610-millimeter) focal length into a more compact configuration, and the camera had a relative aperture of f/3.5 and field of view (FOV) of 10.77° (20 kilometers of surface and 100 kilometers altitude). The lens was rotated about an axis parallel to the SM, and a capping shutter opened during the time the lens passed through a 108° arc (320 kilometers of lunar surface at 100 kilometers altitude) below the vehicle. The light admitted was focused through a variable width slit from a minimum opening of 0.38 millimeters to a maximum of 7.6 millimeters. The slit width and scanning rate (rate of rotation of the lens) established the photographic exposure time. The camera was mounted on rails that were attached to shelves in the SIM. During camera operation, the SM positive X axis had to be in the direction of the velocity vector. The film takeup cassette was removed from the panoramic camera by the command module pilot during trans-Earth trajectory, and was returned to Earth in the command module. 70-millimeter Hasselblad Electric Camera. The 70-millimeter Hasselblad electric camera was used during rendezvous and docking operations and during translunar coast and trans-Earth coast to photograph the Earth and the Moon. It was also used to acquire dim-light, earthshine, and UV photographs (using a 105-millimeter lens). This Hasselblad camera had a motor-driven mechanism that was powered by two sealed nickel-cadmium batteries. The mechanism advanced the film to the next frame and cocked the shutter whenever the camera was activated. The normal 80-millimeter lens could be easily replaced with a 105-millimeter, 250-millimeter, or 500-millimeter lens. 35-millimeter Nikon Camera. The 35-millimeter Nikon camera was mounted in the righthand rendezvous window and periodically made time exposures during the dark portion of the lunar orbit. The purpose of the experiment was to determine whether, and to what extent, reflection from dust particles at the Moulton point contributes to the gegenschein. The gegenschein region was not acquired but, instead, the camera photographed another part of the Milky Way as a result of a translation error in coordinates from the ground. Westinghouse Color TV Camera. A Westinghouse color television camera, used in the command module, could be handheld or bracket-mounted. The scanning rate for the camera was the commercial 30 fps, 525 scan lines lines per frame. The resolution of the camera was 200 TV lines per picture height with an aspect ratio of 4:3 and a range or operation from 5 to 12,000 f-c. A 5-centimeter black-and-white video monitor, which could be Velcro-mounted on the camera or at various locations in the command module, aided the crew in focus and exposure adjustment. A camera ringsight also aided in directing the lens at the desired target. Photographs taken from lunar orbit provide synoptic views for the study of regional lunar geology. The photographs were used for lunar mapping and geodetic studies and were valuable in training the astronauts for future missions. Both the service module and the command module performed orbital photographic tasks. The main photographic tasks during orbit were performed with cameras in the scientific instrument module (SIM), located in the service module. In the SIM bay were two photographic packages: the mapping camera system and the panoramic camera. The service module tasks were to obtain high-quality surface metric/mapping photographs and high-resolution panoramic photographs in both stereoscopic and monoscopic modes. Photographic activity on Apollo 16 began during the first revolution of Earth orbit when crew-option targets (including the Houston, Texas, area) were photographed with the Hasselblad electric (EL) camera. After the translunar injection (TLI) burn, the crew documented the transposition and docking maneuvers with the Hasselblad and the 16-millimeter data acquisition camera (DAC) as the world watched real-time television pictures of the operation. During the period of separate operation of the lunar module and the command service module, the command module pilot (CMP) completed photographic assignments covering a wide range of targets and requiring the use of various combinations of cameras, lenses, and films or operation of the complex SIM camera systems. The dominant CMP photographic task, measured in terms of both time and budgeted film, was lunar surface photography. View eastward from Earth orbit across the coastal plain of Texas and Louisiana. The thin band of blue that separates Earth from the blackness of outer space along the gently curved horizon graphically illustrates the limited nature of the Earth atmosphere. Typical mare terrain illuminated by a high Sun. The smooth surface of the Sea of Clouds approximately 20 kilometers west of the crater Lassell C is pocked by craters as large as 6 kilometers in diameter. A conspicuous 3-kilometer crater and scattered craters less than 200 meters across exhibit bright halos when illuminated by a Sun 35° to 40° above the eastern horizon. The craters without halos appear almost as sharp as the bright-halo craters; Sun-facing crater walls are commonly brighter than adjacent rim deposits. Most craters have low narrow rims that merge imperceptibly with the adjacent mare materials. The Sun-facing wall is approximately as dark as the adjacent mare materials; the rim does not merge with surrounding mare because of a sharp change in slope along its outer margin. Mare terrain illuminated by a low Sun. The Sea of Rains west of the crater Lassell C is illuminated by an extremely low Sun. Sun elevation ranges from 3° to 4° along the left margin of the frame and from 1° to 2° along the right margin. (Compare the upper right quarter of this image with the lower right quarter of the previous image.) The low Sun enhances the detectability of faint slopes. Numerous linear patterns similar to features that have been described as flow fronts or faint mare ridges cross the surface that appeared smooth under the higher Sun. The crater population appears to have increased because the faint depressions that were inconspicuous at higher Sun are now marked by hard shadows. The prominent bright halo of the 3-kilometer-diameter crater has faded. The Earth, photographed in far-ultraviolet light (1304 angstroms) by astronaut John W. Young, Apollo 16 commander, with the ultraviolet camera. The auroral belts 13° on either side of the magnetic equator can be seen crossing each other on the middle of the right side of Earth. The mapping/metric photography was performed using the Mapping Camera Subsystem, which included the metric camera, the stellar camera, and the laser altimeter. This equipment was mounted in the SIM bay section of the CSM. This photography was collected to be used for establishing a unified selenodetic reference system, for photomapping at scales as large as 1:250,000, and for synoptic interpretation of geologic relationships and surface material distribution. The Mapping Camera was operated on 16 passes during the period of lunar orbit. The camera was also used twice during trans-Earth coast, the first time for 2 hours and 29 minutes, and a second time for approximately 13 minutes. Camera operation was near normal. The deployment mechanism exhibited an anomaly; however, this problem had no effect on acquisition of the photography. Inflight contingencies required rescheduling of planned photography, resulting in a loss of approximately 10% of the planned photography. A total of 3481 frames were taken, but only 2491 frames are considered usable. Some frames are blank as a result of exposure during operation with the laser altimeter on the darkside. Astronaut Thomas K. Mattingly II, command module pilot of the Apollo 16 lunar landing mission, performs extravehicular activity (EVA) during the Apollo 16 trans-Earth coast. Mattingly is assisted by astronaut Charles M. Duke Jr., lunar module pilot. Mattingly inspected the SIM bay of the service module, and retrieved film from the mapping and panoramic cameras. Mattingly is wearing the helmet of astronaut John W. Young, commander. 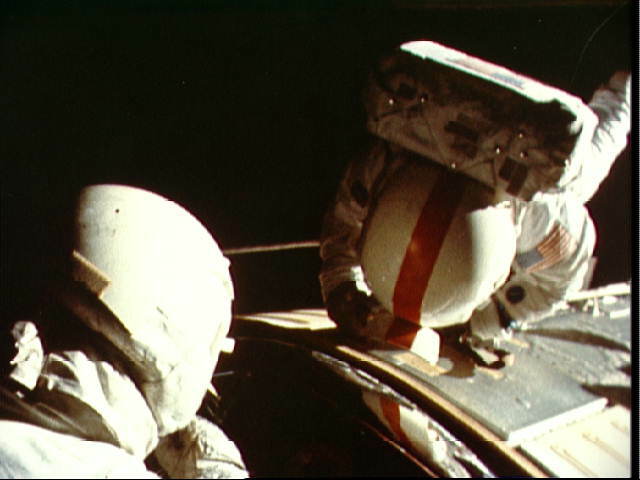 The helmet's lunar extravehicular visor assembly helped protect Mattingly's eyes from the bright Sun. This view is a frame from motion picture film exposed by a 16-millimeter Maurer camera. Rugged farside terrain exhibits a wide dynamic range from black shadows to bright Sun-facing slopes when illuminated by a low Sun. This metric camera frame, centered between the craters Zhukovsky and Stein, was exposed before the first rest period in lunar orbit. Apollo 16 metric camera frame 3005 taken after trans-Earth injection. Light-colored, sinuous markings extend from near the horizon through northern Mare Marginis (upper right) and through Fleming Crater (center). The crater with a crawfish-shaped central peak is King Crater (left of center). King Crater (center) in the farside highlands as viewed from the Apollo 16 spacecraft after trans-Earth injection. King Crater has an unusual crawfish-shaped central peak. The crater was the subject of visual observations and photography on more than one revolution during the mission. The 610-meter (24-inch) ITEK panorama camera obtained high-resolution panoramic photographs, in both stereoscopic and monoscopic modes, of the lunar surface during the Apollo 15, 16, and 17 missions. The camera provided 1- to 2-meter-resolution photography from an orbital altitude of 111 kilometers (60 nautical miles). The panoramic camera was located in the SIM bay of the service module. Panoramic photographs supported photographic data for the other command service module cameras and for the SIM experiments, scanning the lunar surface from lunar orbit, providing greater area coverage and higher resolution for given regions. These are panoramic photographs of cratered areas found near the west rim of the crater Spencer Jones. They are excellent examples of craters that are transitional between the smaller craters (2 to 10 kilometers across) and the larger craters (40 to 90 kilometers across). These craters (centered between the large crater and small bowl-shaped crater in both images) are approximately 15 kilometers across and lack the terraced walls of the larger craters. Although the crater floors cannot be seen, the form of the craters is more similar to the smaller craters. The crew used an enlarged inventory of photographic equipment to document the LM descent, surface activities, and LM ascent phases of the mission and to support sample documentation and scientific experiments on the surface. The fifth lunar landing was unique in the manned exploration of the Moon, as it provided the only opportunity to explore and sample the major geomorphic unit of the Moon, the lunar highlands. The 71-hour, 14-minute stay time of the LM on the lunar surface accommodated three EVA periods for a total of 40.5 man hours of lunar surface activity. Throughout the stay at the Descartes site, a TV camera mounted on the lunar roving vehicle (LRV) provided real-time viewing of most of the crew's activity on the lunar surface. These TV transmissions enabled observers to evaluate the operational capabilities of the crew, to observe the Apollo lunar surface experiments package (ALSEP) deployment and the collection of samples, and to select samples of special scientific interest to be returned to Earth. The LMP removes the 500-millimeter Hasselblad camera from the LRV during the stop at station 11. This camera was used to obtain telephotographs of North Ray Crater and Smoky Mountain. The LRV is parked on the rim of North Ray Crater; boulders in the foreground and on the horizon are ejecta from this crater. This photograph was taken by the lunar module pilot from the LRV as the astronauts drove toward the lunar module near the end of the third EVA. Just to the left of the lunar module is a crater approximately 25 meters in diameter. Stone Mountain forms the skyline along the upper left in the photograph. The golden object in the foreground is the TV camera that provided the Earth with real-time coverage of the mission. Astronaut John W. Young, commander of the Apollo 16 mission, stands at the ALSEP deployment site during the first extravehicular activity (EVA-1) at the Descartes landing site. Components of the ALSEP cover the surface immediately behind the CDR's left elbow. The lunar surface drill is just behind Young and to the right. The drill's rack and bore stems are to the left. The dark object in the right background is the Radioisotope Thermoelectric Generator (RTG). Between the RTG and the drill is the Heat Flow Experiment. A part of the Central Station is at the right center edge of the picture. This photograph was taken by astronaut Charles M. Duke, lunar module pilot. Sample Documentation. While on the lunar surface, the commander (CDR) and the lunar module pilot (LMP) took 1800 photographs, collected 95 kilograms of material, and completed three traverses covering 21.7 kilometers. The collection of samples, together with the documenting photography, provided examples of glass, breccias, igneous rocks, and soils that are valuable in the investigation of the petrology of the lunar surface. The CDR, with Hasselblad camera and documented sample bags hanging from the remote control unit on his chest, folds up a sample bag with his left hand. The LRV is partially visible above the astronaut's left shoulder. The large crater along the right margin of the photograph is Plum Crater. The horizontal splash of white just below the skyline is South Ray Crater and associated ejecta. The photography reference tool known as a gnomon, with color chart marking the locations from which samples have been collected, sits in the foreground. The LMP inspects a rock before sampling the area. A sample bag is held in the LMP's right hand; the cuff checklist on his left arm indicates the tasks to be performed at each station. At station 10, a dense, tough breccia chip with a variety of clasts (sample 60018) was taken from a breccia boulder approximately 40 centimeters in diameter in the vicinity of the LM. According to the crew, this boulder also originated from the South Ray cratering event. Sample 60018 after it was returned to Earth and photographed in the Lunar Receiving Lab. Astronaut John W. Young, commander of the Apollo 16 mission, is photographed collecting lunar samples near North Ray Crater during the third EVA at the Descartes landing site. This photo was taken by astronaut Charles M. Duke, lunar module pilot. Young is using the lunar surface rake and a set of tongs. The LRV is parked in the field of large boulders in the background. 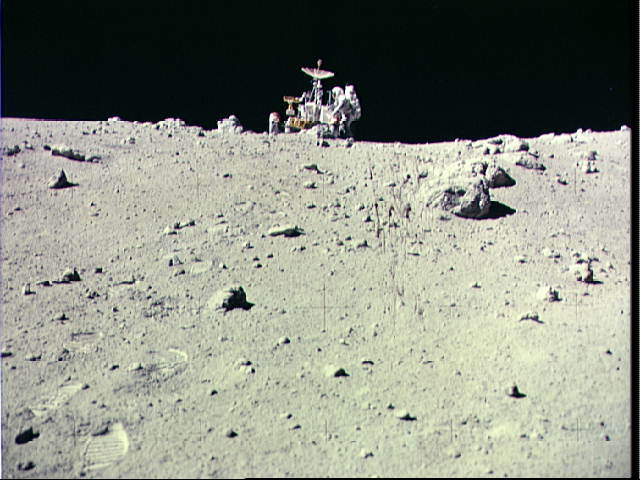 More photographs were returned by the Apollo 16 mission than by any preceding mission. A total of 1587 images were exposed in the panoramic camera. Of these, more that 1415 are high-resolution photographs from lunar orbit. The mapping camera exposed 2514 frames of lunar surface imagery; 927 frames were exposed while the camera operated over the unlighted lunar surface in support of the laser-altimeter experiment. A companion 35-millimeter frame from the stellar camera permitted precise reconstruction of the camera system orientation at the time of each mapping camera exposure. Approximately 440 mapping camera photographs with lunar imagery were exposed between trans-Earth injection and the TEC extravehicular activity. The Apollo 16 crew also returned approximately 2860 frames of 70-millimeter photography, 58 frames of 35-millimeter film, and 21 magazines of 16-millimeter film.